Veggie Nachos and Sriracha Beer Queso Recipe from OhMyVeggies.com! The word “obsessed” is possibly one of the most overused words in the English language right now, so rather than saying I’m obsessed with the idea of a nacho bar party, I’ll say that I’m enthralled with the idea. I’m not sitting on my kitchen floor red-eyed with my knees pulled up to my chest, slowly rocking back and forth while babbling about black beans and queso, nor am I yelling “if I can’t have you, no one will!” at a plate of tortilla chips. 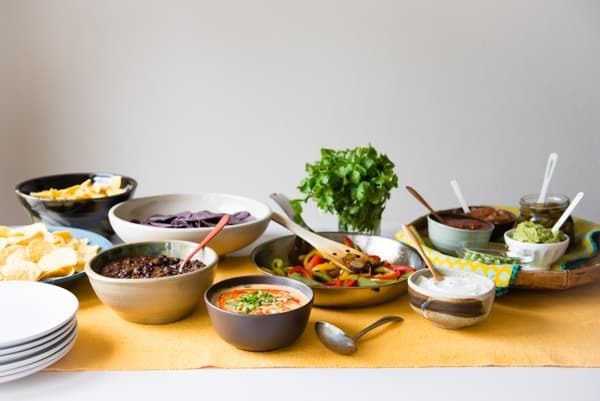 But I’m really into the idea of throwing a party where everyone can assemble their own food with a variety of toppings—grilled cheese, tacos, burgers, there are so many possibilities! Tortilla Chips // Get a few different types for variety—traditional white corn, blue corn and maybe even some of the ones made with vegetables, like sweet potato, beet or kale tortilla chips. Salsa // Again, you’ll want to have more than one variety. Store-bought is fine, but it’s easy to make your own too—I love this Cucumber Mango Salsa recipe. Guacamole and Sour Cream // Need I say more? If you have guests who are vegan, make a cashew-based sauce, like this Cumin-Lime Cashew Cream, as a sour cream alternative. Cilantro, Sliced Green Onions, Jalapeños and Lime Wedges // These garnishes are essential for nacho-making. Unless you’re one of those freaky weird cilantro haters. Beans // You can use rinsed beans right out of the can, but I like simmering black beans with a little salsa, cumin and smoked paprika to infuse them with flavor. Fajita Veggies // It is a veggie nacho bar, after all! Quickly sauté some vegetables with fajita seasoning—a variety of peppers, mushrooms, zucchini and onions are perfect. Queso // You could do shredded cheese or queso fresco, but then you’d have to find some way to melt the cheese. Queso is more practical! You can find a gazillion queso recipes online, some as easy as melting cheese in the microwave and stirring in canned tomatoes and chiles, but my favorite is my Sriracha Beer Queso. The Sriracha Beer Queso, which you’ll find below, is something I whipped up a few years ago as a sauce for mac & cheese. But without the elbow noodles and with a little less liquid, it’s an ideal topping for nachos. You can make it as mild or spicy as you want—if heat isn’t your thing, start with a tablespoon of sriracha and work your way up from there. And if you like things extra spicy, swirl some additional sriracha over the top before serving. If you’re planning on having everyone eat at the same time, you’ll be fine setting everything out on a table as-is. But if you’re going to leave the nacho bar out and let people come back to it throughout the party, fill a large tray with ice and put the cold toppings in there and use candle food warmers or small slow cookers to keep the warm toppings warm. A spicy queso dip that’s perfect for ladling over a plateful of nachos. Adapted from Williams-Sonoma’s Warm Beer & Cheddar Dip. Heat the butter in a medium saucepan over medium heat. Once it’s melted, whisk in the flour. Continue cooking, whisking constantly, for about 2 minutes, or until lightly browned. Pour in the milk and beer, add the sriracha and whisk until smooth; bring to a simmer. Cook until the sauce is thick, about 3-5 minutes. Remove from heat and add the cheese a handful at a time, whisking until melted. Season with salt to taste. Transfer the cheese sauce to a bowl and swirl sriracha over the top, then garnish with green onions. My family would go nuts for this queso! I will have to make it soon! Such a great party idea, I love it! 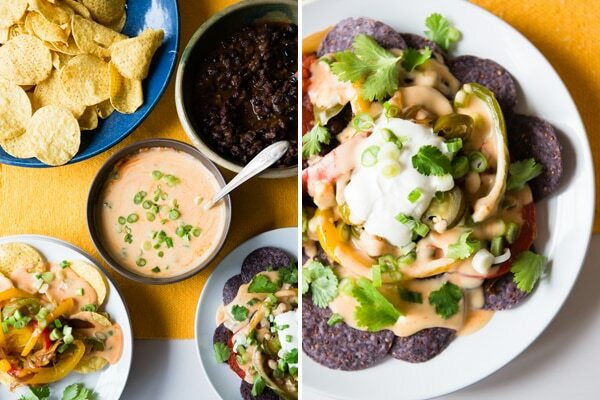 My boyfriend and I are both huge sriracha and beer fans, so I bet we would LOVE that queso! That dip looks so glorious! Would be perfect for a party or get together! Can’t wait to make my own version! I love the idea of veggie nachos. When I make nachos I usually try to stuff as many vegetables in there as I can get away with. I have never thought of hosting a Nacho Party – Great idea for Superbowl Sunday!!! I am equally enthralled with the idea of a DIY food party. I mean, what could be easier on the part of the host, OR more fun! All I have to say is it better include this queso or I will be severely disappointed. Amazing. I want to make a bucket of that queso and be left alone with it.